Sonos announces its first outdoor speaker | What Hi-Fi? As we've suspected since the summer, Sonos is finally leaving the home for the first time. The ‘Sonos Architectural by Sonance’ are designed and ‘optimized’ for the Sonos Amp ($599/£599), which launched in the US in August and has just become available to pre-order in the UK. The Sonos In-Wall ($599/pair) and Sonos In-Ceiling ($599/pair) speakers by Sonance are available for pre-order on sonos.com now, with shipping beginning on February 26th. 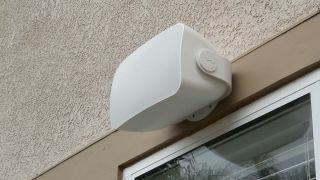 The Sonos Outdoor by Sonance ($799/pair), meanwhile, will follow in April. As was the case with the Sonos Amp, the rest of the world will have to wait patiently for availability and pricing details.